↑ "Former President Reagan Dies at 93", Los Angeles Times, June 6, 2004. Retrieved on July 9, 2013. 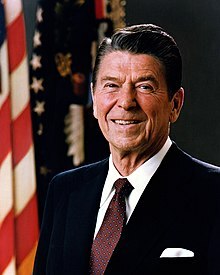 ↑ "Announcing the Death of Ronald Reagan" (Press release). The White House, Office of the Press Secretary. June 6, 2004. Retrieved January 23, 2008.